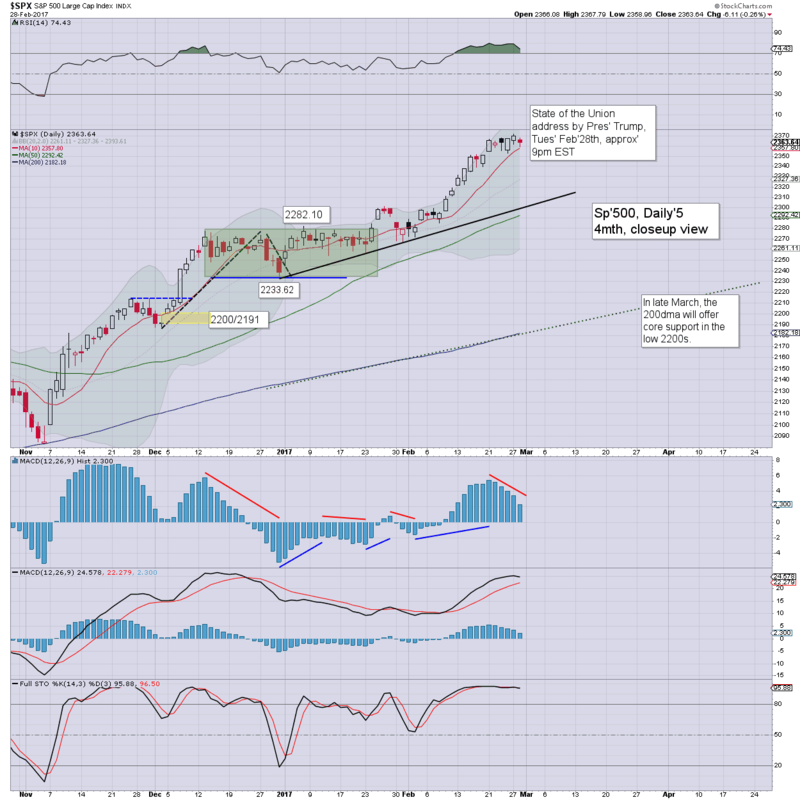 US equities ended the month on a slightly weak note, sp -6pts at 2363. The two leaders - Trans/R2K, settled lower by -0.6% and -1.4% respectively. 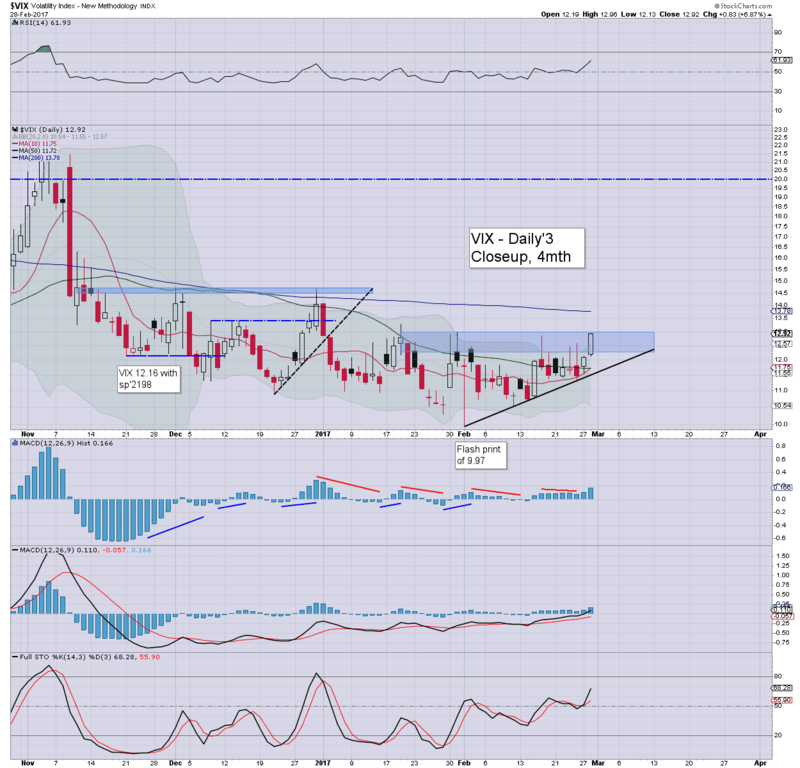 VIX settled +6.9% at 12.92. 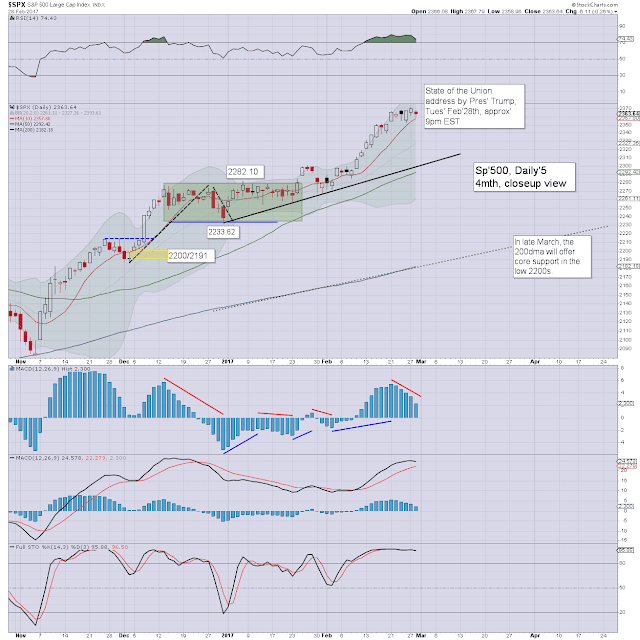 Near term outlook is bullish, as another burst higher seems due before a realistic threat of a sustained move lower. It was a day of minor weakness for the US equity market, as reflected in the VIX which climbed for a second consecutive day. 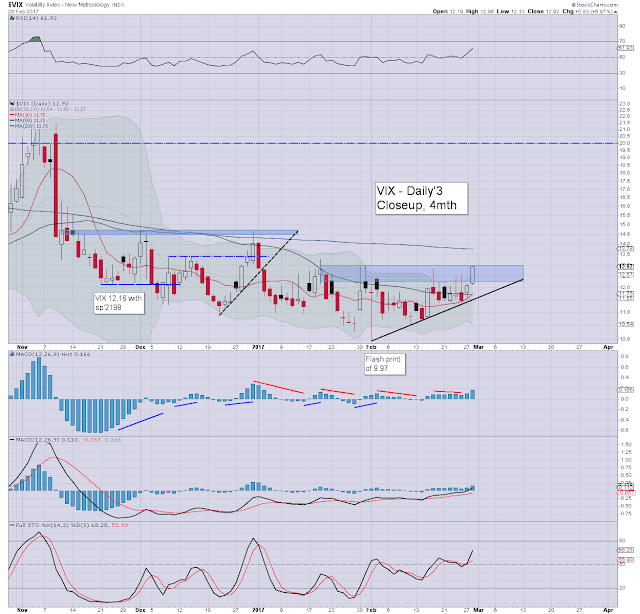 However, its notable that the VIX couldn't see the 13s at all in February... something we've not seen since June 2014. Tonight's address by President Trump is profoundly important. Its not just a speech to placate or inspire his party or even the broader congress/senate. It will be a speech where Trump will lay it all out.... to the world. The US economy is still struggling, and Trump's core aim will be to increase economic growth, whilst also launching a massive re-building scheme across the nation. An infrastructure (phase'1) plan will likely total around $1trn. How will it be funded? I've long believed they could do it via a special 'US infrastructure 30/50yr bond'. Ironically, some of those would no doubt eventually find their way into the balance sheets of central banks across the world. 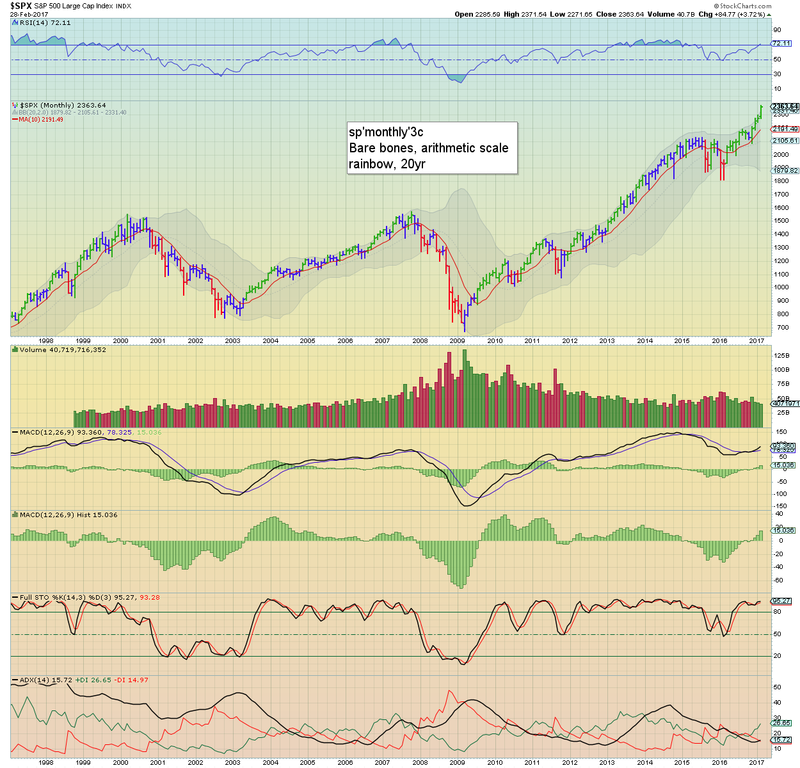 A net monthly gain for the sp'500 of 84pts (3.7%), with a new historic high of 2371. Its been a full year since we saw a bearish red (Elder impulse) candle. I'll cover the US and other world equity markets in depth this coming weekend. It was another very mixed day for the Gold Miners. 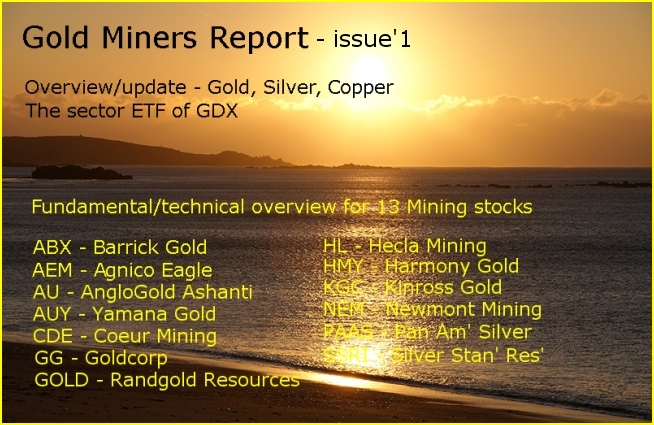 If you're curious to dig deeper, go pick up my first Gold Miner report.